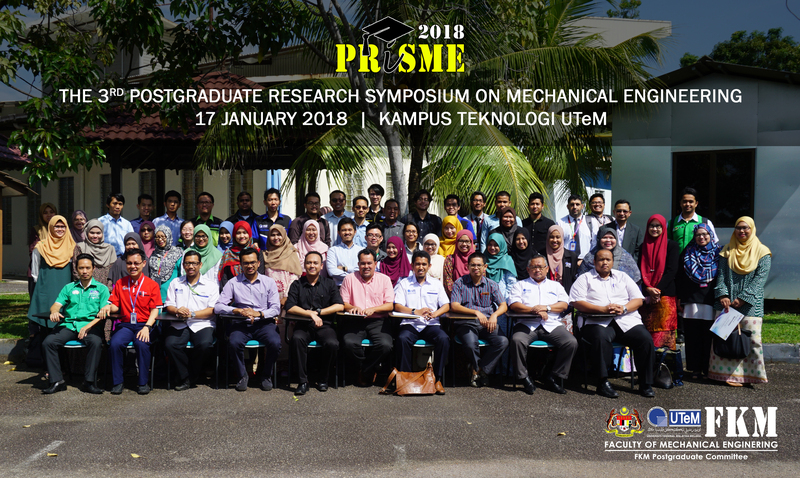 3rd Postgraduate Research Symposium on Mechanical Engineering (PRiSME2018) is jointly organized by the Faculty of Mechanical Engineering (FKM) and Centre for Advanced Research on Energy (CAReR), Universiti Teknikal Malaysia Melaka. This symposium is officially hosted by the FKM Postgraduate Committee. The event will take place at Kampus Teknologi UTeM on 17 January 2018. To provide a platform for postgraduate students to share their research progress in a friendly environment. To provide opportunities for postgraduate students and participants to receive informal in-depth feedback through discussions, and to enable them to establish contact with other postgraduate students. To help students strategize about their research and dissertation, as well as publication of their research in peer-reviewed journals. In accordance with our regulations for Annual Review of Postgraduate Research Students, attendance and presentation at the Symposium is COMPULSORY for ALL registered and full-time research students (semester 3 and above). Attendance is NOT compulsory for full-time research students in Semester 1-2, part-time research students, or students in their waiting for graduation (completed the viva-voce). The presentation materials does not need to be a finished piece of work. The intention is that this exercise should be useful to you as Research Students, both in terms of clarifying your own ideas and gaining more experience of presenting them, and in allowing you to benefit from the questions and comments of those in attendance. We kindly ask all Postgraduate students to confirm their attendance at the Symposium, by completing the Abstract Submission and Registration Form before or on 10 JANUARY 2018. You are advised to discuss with your supervisor(s) about the topic of presentation. Students are also encouraged to submit their 2-pages extended abstract to our satellite event, The 5th Mechanical Engineering Research Day (MERD'18) by 28 February 2018. 1. The 12 parallel sessions of presentation will be held in two slots; six sessions run concurrently in each slot. 2. The allotted time for each presentation is 20 minutes (7 minutes of presentation followed by 13 minutes of moderated questions/discussions). 3. Changes of presentation slot are NOT allowed. 4. Materials to be presented either in PowerPoint or PDF file format. 5. Organizer will prepare a desktop/laptop, projector and laser pointer. 6. Please bring and show Student ID card during registration. 7. Participation certificate will be given after the symposium. 8. Content of presentation should have at least: Introduction, Problem Statement or Motivation, Objectives, Methodology, Results and Discussion, Conclusions.